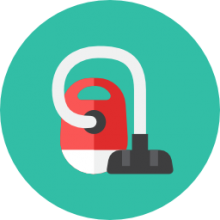 Magnetic sweepers are magnetized push brooms on wheels that can pick up metal waste (staples, nails, pins and other metal debris) inside and usually outside your home, as well (Source). They typically include a release button to easily dispose of the accumulated screws, nails and other metal debris in the home workshop, outdoors, or in machining warehouses (Source). Many buyers purchase them after contractors have finished a roofing job and negligently left a ton of metal debris in their lawn, endangering family pets, car tires, and the naked foot! Luckily, a push-type magnetic floor sweeper can help you pick out all these sharp, metal bits. It may take a couple of rolling passes to get all the nails, but it's worth the effort to avoid an injured pet or a maimed foot. Check out the comparison table below to compare widths- the Neiko has the widest broom head at 36" and the Master Magnetics the smallest at 14.5". The Husky and Central Machinery magnetic sweepers are good for outdoor use, while the others are better suited to indoor sweeping. The Master Magnetics Mini Magnetic Sweeper 4.5 $ 14.5"
The Husky Magnetic Sweeper 4.6 $$ 18"
The Hiltex Magnetic Pick-Up Sweeper 3.9 $ 16"
The Central Machinery Magnetic Sweeper 4.1 $$ 30"
This mini magnetic sweeper offered by Master Magnetics is easy to use, reliable, and efficient for picking up lost screws and nails. Users love the strength of the magnet, but some do note that the handle needs improvement. 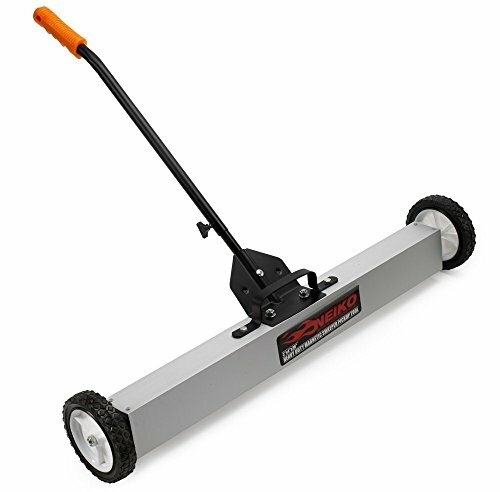 The mini magnetic broom measures 3” x 17” x 43”, and it features a 14.5″ sweeping width that picks up to 1.6 pounds of penny nails, a 1” x 1” frame, 3-inch wheels with hard plastic rims and steel bushings, and a weight of 3 pounds. The handle includes a grip with a convenient hanging pole, and the lightweight aluminum construction guarantees durability. The Master Magnetics sweeper is available also a 27” sweeping mode. A purchaser shares that the mini sweeper is perfect for flower beds and yards and that he was utterly surprised how many nails it managed to pick. He states that he gathered at least 50 screws with the first sweep and that this is the ideal tool to keep nails and screws away from children and pets. Another reviewer mentions that the mini sweeper is more powerful than he expected and that it’s well-made, light, and easy to clean. A user also adds that it’s no bother to assemble the magnetic sweeper and that he highly recommends it. However, some customers have complained that the screw that holds the handle lasted only a couple of weeks and then broke. Some also note that the magnet is too far away from the ground. This 36-inch magnetic pick-up broom with wheels offered by Neiko is well-made, easy to use, and an excellent choice for cleaning after a roofing job. Users love that it’s easy to maneuver the sweeper, but some do note that it’s not very suitable for grass or gravel. This nail picking sweeper measures 38.2” x 8.7” x 7.9”, and it features a weight of 19.6 pounds, a quick-release handle to remove attached particles immediately, a 36-inch sweeping width, a telescoping handle that you can adjust from 29 inches to 42 inches, and 7-inch large wheels. This sweeper can pick objects up to 30 lbs. A buyer comments that the magnetic broom is perfect if you want to clean concrete and that you need only one or two sweeps to get everything. He says that if you’re using it to pick nails up in grass, you must immediately dispose of the nail after you hear the clicking sound. Another user shares that he found over four pounds of staples and nails and that he is extremely pleased with the usefulness of the Neiko magnetic sweeper. A reviewer shares that he uses the sweeper weekly with no issues and that it pick-ups metal objects even if they’re slightly covered in dirt. However, most customers have complained that the screw on the handle broke when they tried to tighten it and that the handle should be improved and re-designed. Some also state that it needs bigger and better-designed wheels and that they had problems with the package. If you need a reliable tool to find all the missing screws and nails, you might take a look at this 18-inch magnetic broom offered by Husky. Users love the design and the width of the tool, but some do note that it’s overpriced. 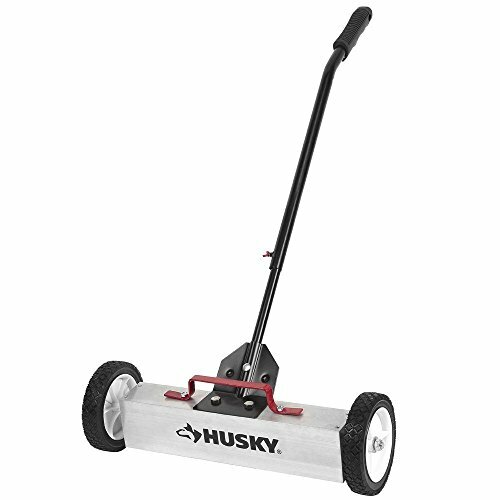 The Husky magnetic sweeper measures 6.7 x 8.7 x 36.6 inches, and it features an 18-inch sweeping width, a telescoping handle that you can adjust from 30 inches to 40 inches, and sturdy rubber wheels that would prevent damage to your floors. The sweeper also has a heavy-duty aluminum construction and a quick-release option to discard all collected items. A buyer comments that he was very surprised how many nails he managed to pick with this sweeper after his roof renovation and that it saved him a lot of flat tires. He adds that the dump lever is convenient and easy to use and that he highly recommends the Husky magnetic sweeper. Another reviewer mentions that the large wheels are perfect for gravel or any uneven terrain and that the sweeper works flawlessly. However, the customer complains that it’s heavy and difficult to move around. A happy purchaser shares that this pick-up sweeper is a necessity for every workshop and that it’s well-built and easy to use. The user states that the wheels are perfect both for indoor and outdoor use and that he highly recommends it as the best magnetic sweeper. This 16-inch magnetic sweeper offered by Hiltex is strong, efficient, well-constructed, and suitable for multi-surface floors. Users love the price and the strength of the magnet, but some do note that the wheels are too small. 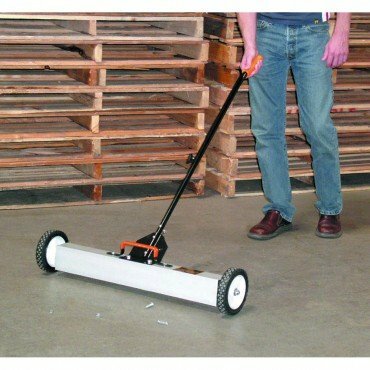 The Hiltex sweeper for nails measures 25.6” x 18.5” x 2.8”, and it features a sweeping width of 16 inches, a spring-loaded handle that you can extend from 21.5 inches to 35.5 inches, a weight of 3.7 pounds, and wheels with a diameter of 1-7/8 inches. Overall, this is an excellent choice if you are in need of affordable and durable magnetic sweeper. A purchaser states that the Hiltex sweeper for screws arrived quickly and that it’s easy to put it together. The reviewer says that he didn’t have any issues to roll the sweeper around and that it picked up more nails than he expected. Another happy user mentions that he gathered 3.4 lbs of nails and screws and that the sweeper is ideal for occasional use. A buyer also adds that the magnet sweeper is perfect for cleaning up his lawn and that the magnet is unbelievably strong. He comments that he has been using it for several weeks and that he couldn’t have been more pleased. However, some customers have complained that the handle is cheaply made and that it’s a little flimsy. Some users also note that the wheels started to bend after a couple of days. If you don’t want to spend hours trying to pick up nails and screws from your lawn, you might take a look at this 30-inch magnetic sweeper with wheels offered by Central Machinery. Users love the extra-wide sweeping head, but some do note that it’s overpriced. The head of this sweeper for nails measures 30” x 3” x 4”, and it provides 50 lbs of magnetic pull. 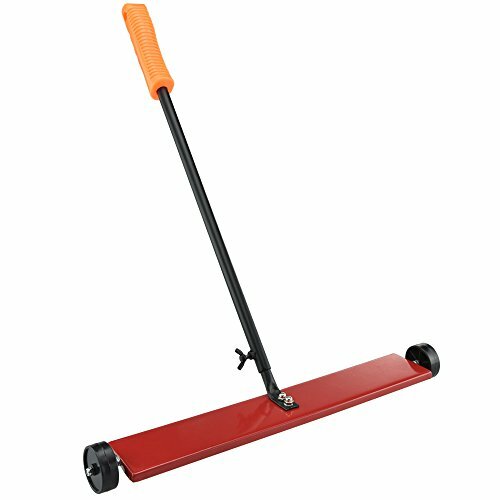 The sweeper features a one-pull release to quickly get rid of debris, a telescoping handle that you can extend from 30 inches to 44 ½ inches, 7-inch wheels, and a weight of 20.5 lbs. The Central Machinery sweeper is suitable for shop floors, carpets, and grass. In general, buyers have a favorable opinion regarding this magnetic sweeper with wheels, and they praise its usefulness and convenience. A customer mentions that the sweeper made his job of cleaning 20, 000 sqft of space very easy and that it works smoothly. Another happy user shares that he had no issues to use the sweeper on grass and that it picked up every nail. He adds that it’s made of quality materials, but it’s heavy. A purchaser mentions that the magnet is powerful and that the sweeper is easy to move around. However, some customers have complained that they had problems with the wheel bolt and that the magnet is too close to the ground. Follow included instructions to assemble your sweeper. Adjust the handle to a comfortable height. Roll the sweeper over the items you want to pick up. Use the release button to discard of the items you've gathered in a receptacle. The first magnetic nail sweeper we took a look at it is manufactured by Master Magnetics- it has a 14.5-inch brooming width and is equipped to magnetically attract up to 1.6 pounds of eight penny nails. You can purchase two different sweeping widths- the 14.5 inch broom and the 27 inch broom. Some buyers we spoke with use them to pick up nails out of grass before mowing the grass with a lawn roller, magnetically extract staples from a lawn, and retrieve sewing pins from a wood floor surface. One tool shop homeowner told us that he employed this rolling magnetic sweeper, in addition to a fork-mounted sweeper, in his workshop to sweep up a bunch of different small metal items that included brass brackets and screws. Another reviewer who was cognizant of commercial-strength hanging magnetic sweepers, purchased this smaller option to ensure that there were not any dangerous metal pieces in her backyard that her dogs might be prone to stepping on or swallowing. She told us that it worked pretty decently an her gardens, and even better on the blacktop surface of her driveway. In terms of assembly, all you need to do is screw it together- though she and another reviewers we interviewed told us that the handle is prone to loosen every so often you do have to give it a turn to keep it tightly fitted together. Other reviewers say that after you are a remodeling job, it's a good idea to do a full tow behind sweep of the interior and the exterior of your house to make sure there are not any stray, sharp metal objects like staples or nails- and you can use a glove to pick them up to ensure you don't cut yourself with rusted metal. Another reviewer says that while there are more expensive options available, he found that if he took multiple passes over his lawn he was able to find all of the embedded and loose nails littered from a residing project he had undertaken in the summer. A professional roofer we interviewed told us that for a long time he had held off on purchasing a rolling magnetic sweeper- mainly because the prices he saw at Harbor freight, target, Lowe's and Home Depot were prohibitively expensive. However, online competition has decreased prices and he has been pleasantly surprised with the effectiveness of this magnetic sweeper saying that every time a nail catches on to the magnetized broom a little ping sounds which is highly satisfying. The second magnetic pickup sweeper we examined is the Neiko option- it comes in 24 and 36-inch options designed to retrieve ferrous metals including screws and nails, helping to safeguard your tool shop or lawn from injuries to your feet or damage to your vehicle's tires. One reviewer did make the recommendation that since these magnetic sweepers are so low to the ground, they are not ideal to work on bumpy, soft or uneven surfaces. One professional roofer tells us that working on blacktop and cement surfaces is a breeze, however, you want to take several passes over lawns because sweeping your magnetic broom over dirt, leaves, and grass is much more challenging. That said, if you apply your magnetic sweeping diligently and discover an effective routine that works for you, you can be assured that you will remove the vast majority of the sharp metal objects from your lawn. Another reviewer says that by adjusting the lock nuts on the tires you can actually adjust the height a bit, which makes it easier to work on lawns and other uneven and soft surfaces. The third magnetic sweeper pick up tool we examined is the 18-inch Husky. Its magnetic working area, Husky says, provides a spacious collecting area to gather up metal waste that has been unleashed on your floor or lawn. As well, they have included a telescoping handle that extends in length from 30 inches all the way to 40 inches- connecting to a pair of highly maneuverable rubber wheels designed to keep your hardwood floors undamaged. One handy feature this magnetic pickup tool includes is that after you broomed area and extracted a bunch of miscellaneous metal parts, you can pull a dump lever that will release all of the metal and nails- a great way to easily dispose of these dangerously sharp metal objects. Other reviewers say that while it is a bit heavier than other options on the market, it is pretty rugged, enabling reviewers to travel over rocky areas of gravel to extract those recalcitrant nails. The fourth magnetic pickup sweeper we examined was the 16-inch Hiltex that the advertisers write is especially useful for picking up metal shavings, screws, nails for a variety of different surface types. It features a spring loaded telescoping handle that extends from 21.5 inches all the way to 35.5 inches with a 1 7/8 inch diameter castor wheels. Reviewers describe how after a roofing job their contractor neglected to effectively clean up after themselves- so this enterprising homeowner told us that they purchased this magnetic broom to pick up all of the stray metal shavings and screws and nails that had accumulated around the perimeter of his three-bedroom home. Reviewers say that it is not the most sturdily designed and connected option, but if you are only using it relatively infrequently it will certainly satisfy your needs. However, you might want to look towards a heavier-duty commercial option if you are using this on a daily basis. In general, buyers say that it is a bit flimsy, but for the price it is outfitted with particularly strong magnets that will do the job indoors and outdoors. The last magnetic sweeper with wheels we examined was produced by Central Machinery- it is a 30 inch model with 7-inch wheels that are designed to work on grass and carpet. It's outfitted with an extra-wide sweeping head that promises a 50-pound magnetic pull and a quick release handle to help you dispose of all of the accumulated metal debris on your broom head in a waste receptacle. One property manager in charge of cleaning out a four-story, carpeted building said that a vacuum had been run over the premises but hadn't picked up all of the metal bits. His management company invested in one of these magnetized push brooms and they were able to clean out the building of all of the dangerous metal shards so that new families could move into the rental properties. Other reviewers concur, saying that it has been effective on grass and indoor surfaces areas, effectively cleaning up after negligent roofers left tons of metal waste around the perimeter of their homes.